Here’s a way to do it that should satisfy liberals and conservatives. The people making minimum wage have borne the brunt of our bad economy. A minimum wage worker working 40 hours per week makes less than $15,000 a year. Right at the poverty level for a family of two. Raising the minimum wage would immediately inject cash into the consumer spending sector because these workers spend most of what they earn. This is fuel our economy needs right now. The minimum wage has not kept pace with inflation. 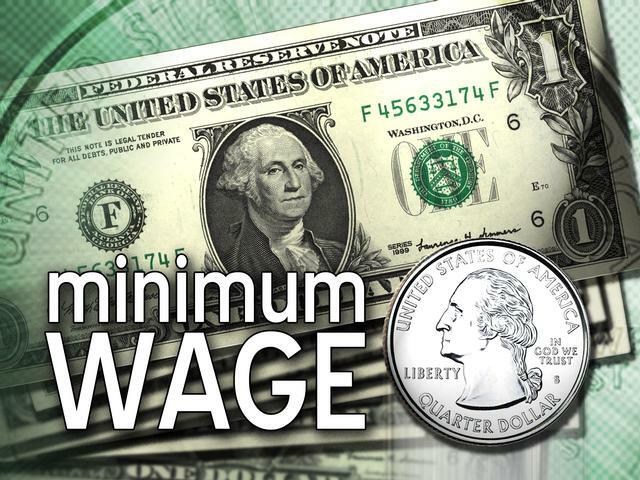 The current minimum wage of $7.25 is significantly lower than the $10.00/hour value it had in 1968. The downside is what you’d expect, namely that the cost for this raise would have to be covered by the companies who employ the minimum wage earners, and it means they’d have to cut something else. Business owners complain that they can’t afford it, that they’d be unable to hire more workers, or that they may even have to let some people go. A Principle: Who should get that extra dollar? Before I introduce my proposal, consider this question: Suppose a small company had an extra dollar. Is it better for that dollar to go to the government (as tax) or to a minimum wage worker (as income)? If the dollar went to the government it will eventually make its way into our economy to be spent on all those things the government does, including programs to help those in poverty. But the path is not efficient. Along the way it will compensate the government workers who manage those programs, and they make well above minimum wage. Why not give that dollar directly to a person in poverty, who is working and contributing to the economy? The tax credit would only apply to hourly workers in job categories that include minimum wage workers. The credit would only accrue up to some maximum, say $10.00/hour. This plan would enable companies to immediately improve the pay for their minimum wage workers. It would likely improve the quality of their workforce as well because it would reduce the pressure on these workers to take on additional jobs. The plan would also distribute about $28B annually to folks who will likely spend it immediately, boosting GDP directly. Based on the numbers outlined in the NPR story linked to above, this plan would reduce federal tax revenue by about $28B out of a total of $2,500B, or about 1.5%. Presumably, these costs would be made up for quickly in terms of improved GDP. One last thought: Some might view this plan as a “tax cut for corporations.” But keep in mind that companies will only be able to leverage this tax cut if they pay their minimum wage workers more. The plan could also be viewed as a stimulus/wealth re-distribution plan where the beneficiaries are those who are: a) Working and producing, and b) at the poverty line. I can’t imagine a better target for such dollars. Basically, I like it a lot. There may end up being consequences I haven’t anticipated, so I look forward to the discussion. One interesting question is how much this would increase the take-home pay for a minimum wage worker. They may not pay Federal income tax, but they face a lot of other payroll taxes. Let’s be realistic about how much additional money we’re putting into their pockets. I fail to see how an experiment, such as the one you propose as policy above, could be anything except positive. Yes, it _might_ have some perverse consequences but we are all guessing about what they are, and it seems to me that Tucker’s proposal at least offers no way for the wage of the low-end of the labor market to be *reduced*. Short of a reduction in their meager pay, I think almost anything that could benefit the working poor should be tried with vigor. I think the better idea is to enforce the minimum wage rules we have right now. Moreover, I think everyone including illegal immigrants shoul be paid at least minimum wage, and we should enforce that with 20 year jail terms. That way there’s no incentive to hire illegal immigrants over Americans. What prevents a company from marking a job as “minimum-wage job” even though it isnt? For example, if a company pays 10$ for a particular position and lets say minimum wage is 8$, what prevents them from marking that job as a minimum-wage job and claim 2$ tax credit? The minimum wage is a socialist concept that acts like a high pass filter in the job market. It may boost morale for some, but it actually eliminates the lower end of the jobs in the economy, creating more unemployment. Companies that pay minimum wages now must fire people or do cuts somewhere for sure. There shouldn’t be a law for everything, workers can ask for a raise for themselves if the case. Therefore, the concept of minimum wage, despite its good intentions, turns out to be toxic. Andrei, I don’t think you read my posting, because the mechanism I propose does not cost the company. It costs the government tax revenue. Why multiply by SQRT(252) to compute the Sharpe Ratio?